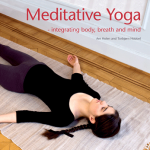 The book Meditative Yoga: Integrating Body, Breath and Mind by Are Holen and Torbjørn Hobbel (Dyade Press, 2012) presents the principles of meditative yoga, as well as more than 60 yoga exercises. Three points are particularly important. In yoga exercises, one stretches the muscles gently and without force. One maintains the stretch for some seconds without incurring strain or pain. In this way, the muscle fibers and tendons will slowly yield; their tonus is changed, and over time they become somewhat elongated. This kind of cautious stretching is easily combined with a calm and unrestrained breathing. Gentle stretching facilitates the kinds of muscular changes that take place during relaxation. Too intensive stretching may inflict pain; movements and breath become tense and stiff – signs that the person is pushing himself too far. In sports and physical exercise, in contrast, the emphasis is mostly on muscle contractions involving force. In classical yoga, the movements should be slow and made at a constant, unhurried pace, without force, jerking or pulling. This also goes for the transitions between one posture and the next. Yoga exercises should be done together with deep, calm, even, and powerful breathing, approaching the full yoga breathing. The breathing should be audible to the practitioner from inside the body, the sound usually coming from the back of the nose or the throat. The speed of the body movements should follow the rhythm of a deep and effortless breathing. The breathing should guide the movements, and the movements should guide the breathing. In yoga exercises, the breathing should be attuned to and follow the movements. When the body bends forward, it is natural to exhale. When one straightens the body, it is natural to inhale. When lifting the arms, the ribs are also lifted and one inhales. Movements are not completed until the breathing in and out is completed. Or the other way around: one does not start and stop the inhalation/exhalation until the movement is started or completed. The two should be coordinated. As well as practising meditation which I have been doing for a number of years now, I recently started yoga classes. I now sit more comfortably whilst meditating and can now meditate better and deeper thanks to greater flexibility and strength. Because of my years of meditating, I feel I can hold the poses and meditate on the breath whilst in the pose. This, I believe is the essence of meditative yoga. ← This is for me!